By David J. Hogan. Softbound - 334 Pages. First edition hardback. 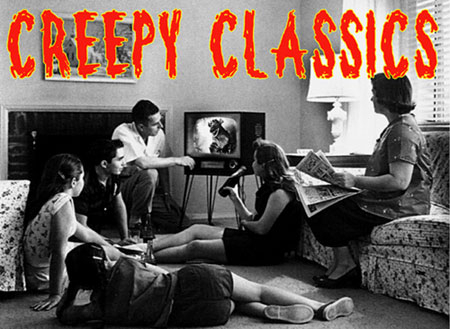 High quality, literate book on classic horror films. Quality paper wit serious insights and beautiful photo reproductions. 262 pages. New and unread, just some small sticker residue on dust jacket. Great biography on Boris Karloff...lots of photos. 274 pages. Soft cover edition. By Mark F. Berry. Comprehensive filmography with facts, plots, commentaries and both black and white and color photo illustrations. From obscure silents through giant monster blockbusters. A big softcover with 481 pages. Jimmy Sangster proves the pen is mightier than the stake as he reflects upon his film career from his early apprenticeship in the British film industry to Hammer Films mainstay and then to a stint in Hollywood and television. Autobiography. Rare Doctor Who softcover book from the early 80's "Doctor Who- The Making of A Television Series"; These were produced back in the early 80's to promote the long running hit British TV Series "Doctor Who." New, just small price sticker residue on cover. Collected short stories by Clark Ashton Smith. A self-educated poet and author best remembered for his short stories of fantasy, horror, and the supernatural published in genre pulp magazines such as Wonder Stories and Weird Tales in the late 1920s and 1930s. A LARGE photo film book with hundreds and hundreds of film frame-blow-ups and dialogue from the 1931 DR. JEKYLL AND MR. HYDE. Missing scenes discussed and amazing stills used to depict the entire film. Edited by Richard Anobile. Excellent! A 1968 edition of Robert Louis Stevenson's Dr. Jekyll and M. Hyde, plus other stories. Lancer Magnum Easy Eye paperback edition. Appears unread, right off the shelf from 1968! Great cover painting too. Complete and unabridged. Edited and history/background by film historian David Skal! The original stage play reproduced with hundreds of photos from stage performances, most with Bela Lugosi. Rare pictures. Original playbill reproductions, marketing of Dracula through the Monster Boom of the 1960s and 1970s! A deep look at the fantasy films of the great Val Lewton. They're here: CAT PEOPLE, CURSE OF THE CAT PEOPLE, I WALKED WITH A ZOMBIE, ISLE OF THE DEAD, BEDLAM, 7th VICTIM, BODY SNATCHER, LEOPARD MAN, GHOST SHIP. Book seems unread and new except for minor chips, tears on dust jacket. Photos too! By Sax Rohmer. From th creator of Fu Manchu, Sax Rohmer's classic paperback edition from the 1960s. By Greg Mank, James Coughlin and Dwight D, Frye. The first edition original softcover with original cover. The dramatic rise and fall of the actor who won immortality as the giggling Renfield of Dracula and the sadistic hunchback of Frankenstein. Authorized by Dwight's son.